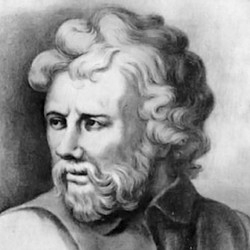 Epictetus was a famous Philosopher from Greece, who lived between 55 AC and 135 AC. Epictetus was a Greek Stoic philosopher. He was probably born in Hierapolis. His birth name is unknown, the word "Epiktetos" simply means "acquired." He came to Rome as a slave, where he was released and lived much of his life, until he was forced to exile to Nicopolis, Greece. Here he worked as a teacher, and lived in town until his death. Epictetus was born in Phrygia, and was possibly a slave from birth. He came to Rome as a slave, and worked in different houses until he was released. We don't think that Epictetus wrote down he's own works, it was probably the student Arrianos who recorded them. In contrast to the early stoic Epictetus was less concerned with the metaphysical world view, and more concerned with ethics and conduct. Epictetus magnum opus, "Enchiridion" (= "Manual") deals with Epictetus's moral philosophy. Epictetus parts into the events that you can do something and they can not do anything. The former group includes our actions, statements, reactions, thoughts and feelings. For the latter group includes everything else, including our body, our fate (and therefore our careers), our wealth and many other things. For Epictetus, it is that you can not do anything too irrelevant to being a good person. The textbook of Epictetus is thus basically on how to respond to external stimuli like change in wealth, career, death of family members, own death and so on. Epictetus considered among the great Stoic philosophers, and he had great influence on Marcus Aurelius. Our collection contains 54 quotes who is written / told by Epictetus, under the main topics: Happiness, Health, Imagination, Motivational, Wisdom. "It is the nature of the wise to resist pleasures, but the foolish to be a slave to them"
"One that desires to excel should endeavor in those things that are in themselves most excellent"
"Nothing great is created suddenly, any more than a bunch of grapes or a fig. If you tell me that you desire a fig. I answer you that there must be time. Let it first blossom, then bear fruit, then ripen"
"It's not what happens to you, but how you react to it that matters"
"It is not he who reviles or strikes you who insults you, but your opinion that these things are insulting"
"It is not death or pain that is to be dreaded, but the fear of pain or death"
"It is impossible to begin to learn that which one thinks one already knows"
"Is freedom anything else than the right to live as we wish? Nothing else"
"Imagine for yourself a character, a model personality, whose example you determine to follow, in private as well as in public"
"If you wish to be a writer, write"
"If you want to improve, be content to be thought foolish and stupid"
"Neither should a ship rely on one small anchor, nor should life rest on a single hope"
"To accuse others for one's own misfortunes is a sign of want of education. To accuse oneself shows that one's education has begun. To accuse neither oneself nor others shows that one's education is complete"
"Make the best use of what is in your power, and take the rest as it happens"
"Not every difficult and dangerous thing is suitable for training, but only that which is conducive to success in achieving the object of our effort"
"Never in any case say I have lost such a thing, but I have returned it. Is your child dead? It is a return. Is your wife dead? It is a return. Are you deprived of your estate? Is not this also a return?" "We are not to give credit to the many, who say that none ought to be educated but the free; but rather to the philosophers, who say that the well-educated alone are free"
"If you seek truth you will not seek victory by dishonorable means, and if you find truth you will become invincible"
"If you desire to be good, begin by believing that you are wicked"
"If virtue promises happiness, prosperity and peace, then progress in virtue is progress in each of these for to whatever point the perfection of anything brings us, progress is always an approach toward it"
"If thy brother wrongs thee, remember not so much his wrong-doing, but more than ever that he is thy brother"
"If one oversteps the bounds of moderation, the greatest pleasures cease to please"
"If evil be spoken of you and it be true, correct yourself, if it be a lie, laugh at it"
"He is a drunkard who takes more than three glasses though he be not drunk"
"God has entrusted me with myself"
"Freedom is not procured by a full enjoyment of what is desired, but by controlling the desire"
"First learn the meaning of what you say, and then speak"
"Do not seek to bring things to pass in accordance with your wishes, but wish for them as they are, and you will find them"
"Do not laugh much or often or unrestrainedly"
"Difficulties are things that show a person what they are"
"Control thy passions lest they take vengence on thee"
"Be careful to leave your sons well instructed rather than rich, for the hopes of the instructed are better than the wealth of the ignorant"
"All religions must be tolerated... for every man must get to heaven in his own way"
"All philosophy lies in two words, sustain and abstain"
"You may be always victorious if you will never enter into any contest where the issue does not wholly depend upon yourself"
"You are a little soul carrying around a corpse"
"Whoever does not regard what he has as most ample wealth, is unhappy, though he be master of the world"
"Whenever you are angry, be assured that it is not only a present evil, but that you have increased a habit"
"When you are offended at any man's fault, turn to yourself and study your own failings. Then you will forget your anger"
"The two powers which in my opinion constitute a wise man are those of bearing and forbearing"
"The greater the difficulty the more glory in surmounting it. Skillful pilots gain their reputation from storms and tempests"
"The essence of philosophy is that a man should so live that his happiness shall depend as little as possible on external things"
"Silence is safer than speech"
"Practice yourself, for heaven's sake in little things, and then proceed to greater"
"People are not disturbed by things, but by the view they take of them"